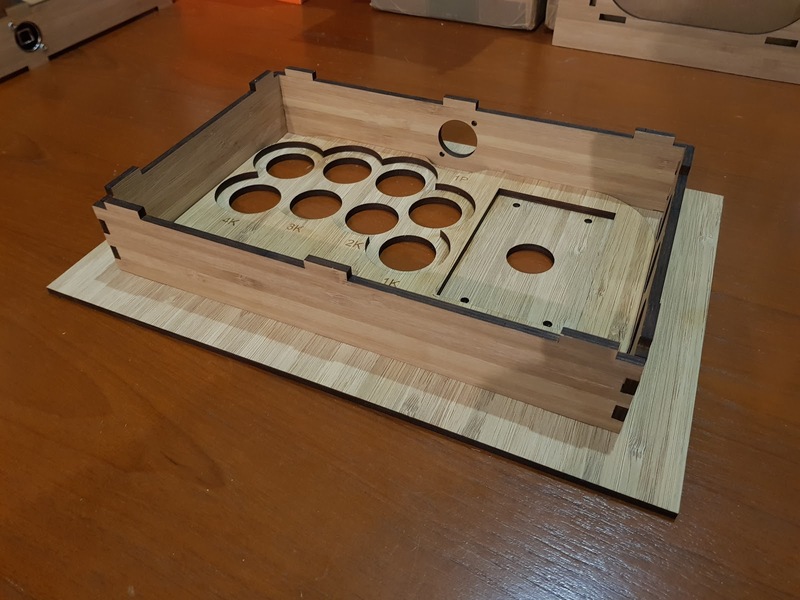 Prototypical Design: Flat-Pack Fightstick - An affordable pre-cut kit which makes a kickass controller! The kits are fully laser-cut, include the acrylic layer, and only require a splash of PVA to assemble. This one is in bamboo ply, which i'm loving, but a few other woods are available. 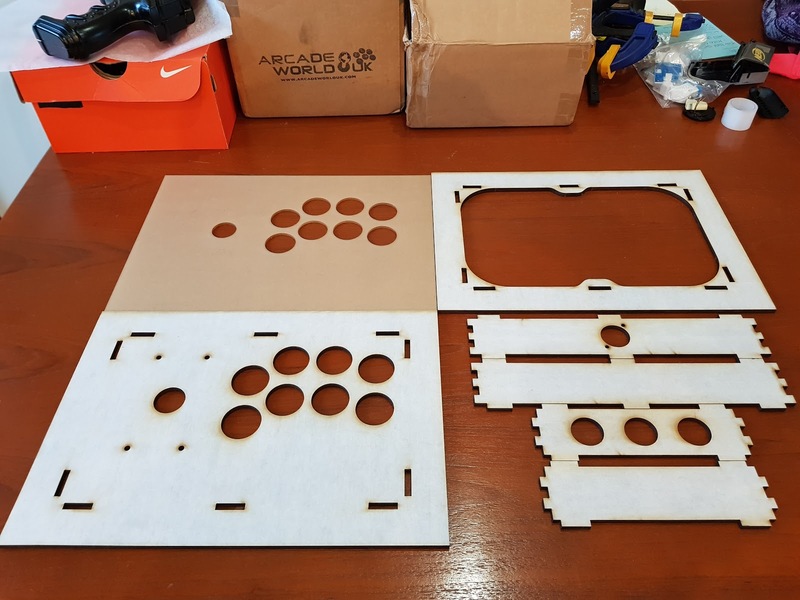 It's also easy to customise the button layouts, accommodate for a Wiimote, fit Korean or American parts, or go for a hitbox. Two sizes are available, either 400x300mm (A3 size art layers), or 300x210 (A4 size). Because the outer frames are still Ikea Stromby picture frames, you can either source them yourself to save a couple of bucks, or have them included in the package as they barely change the postage rate. They're available in raw aluminium or black, and both look fantastic next to typically plastic retail cases. Here's the 400x300 and 300x210 kits side-by-side. 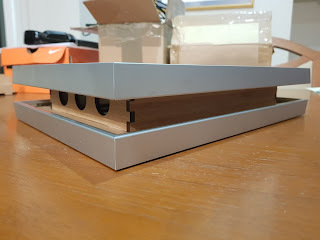 The wood and acrylic is kept safe under a paper wrap. This is the 300x210, done up with the Sega Player 2 layout (my favourite), three 24mm system buttons in the side, and a space for a Neutrik USB adapter in the top edge. It's all customisable. 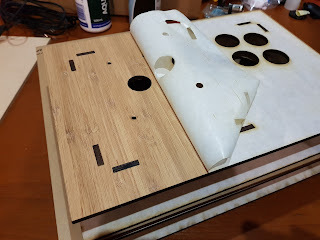 The paper looks a little burnt from the laser cutting, but the wood underneath is even, with a smooth charred edge. If you want to paint the stick (i usually leave the top and bottom surfaces raw but paint the mid-section), you can actually leave the paper on to hide the grain, or use the grain. 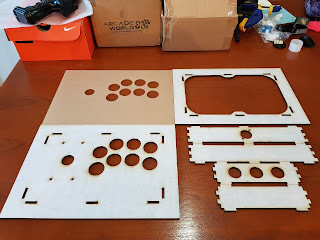 Sanding is the only weakness of this plywood, it doesn't work particularly well. If you want to get a really smooth finish you can opt for a more traditional wood like hoop, or build up a few layers of paint and use some wet-and-dry sandpaper to level it. 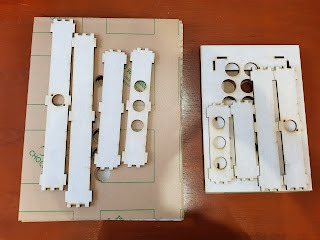 The bottom plate separates from the top plate, which has an additional reinforcing layer added to it. 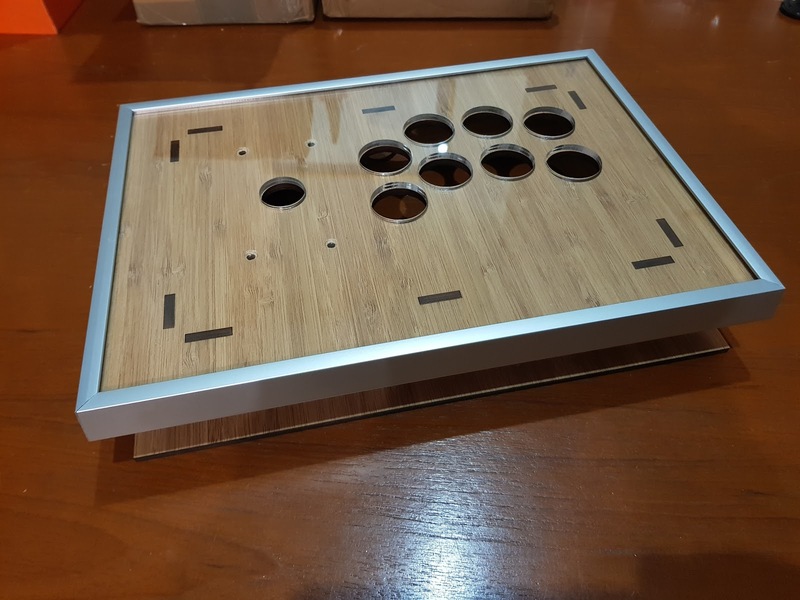 This makes the stick incredibly strong and stiff, it won't ever flex in play, and the case can take my 95kg, on one foot. Apply a little PVA glue to the mating surfaces, and slot the side panels into the top. Make sure to have that top panel with the Neutrik hole the right way around, as it's directional. The countersunk divots will be on the outside. 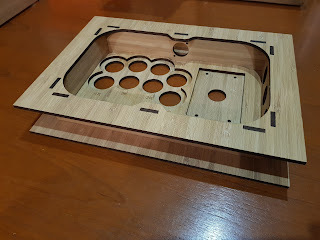 The case with all four sides installed. 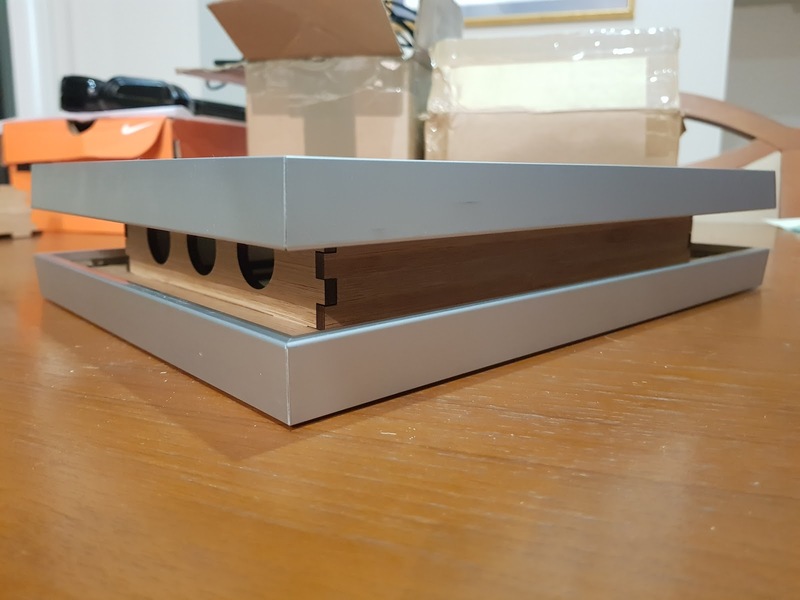 The bottom plate slots on last, pulling the sides tightly together. 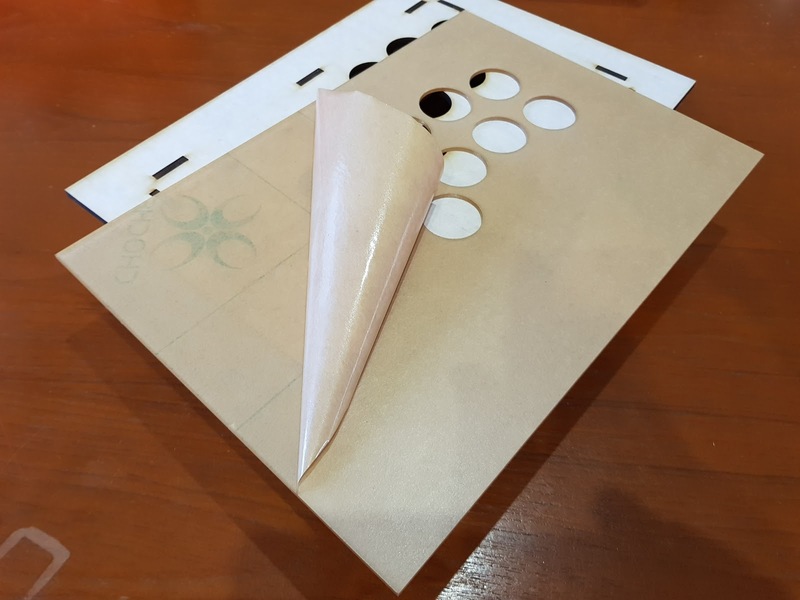 The glue should only take an hour or so to have functional strength, but total curing may take up to 24 hours depending on environmental conditions. Standard glue protocol. I've etched the button labels found on Brook PCB's into the case. This just makes it slightly easier to remember the wiring order, as sometimes even i get it backwards when working from the inside. The indent for the stick will fit any standard Sanwa or Seimitsu stick. Other sticks, like the Fanta or even Happ can be accommodated for at the ordering stage. Here's the side view. 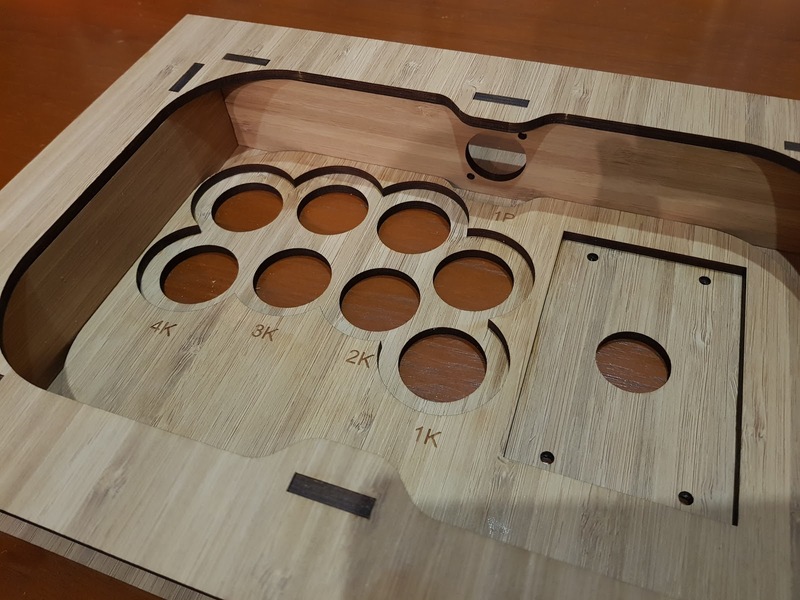 You can see the system buttons are indented to protect against accidental presses during a fight. They're still easy to reach, but out of the way. And the top view. 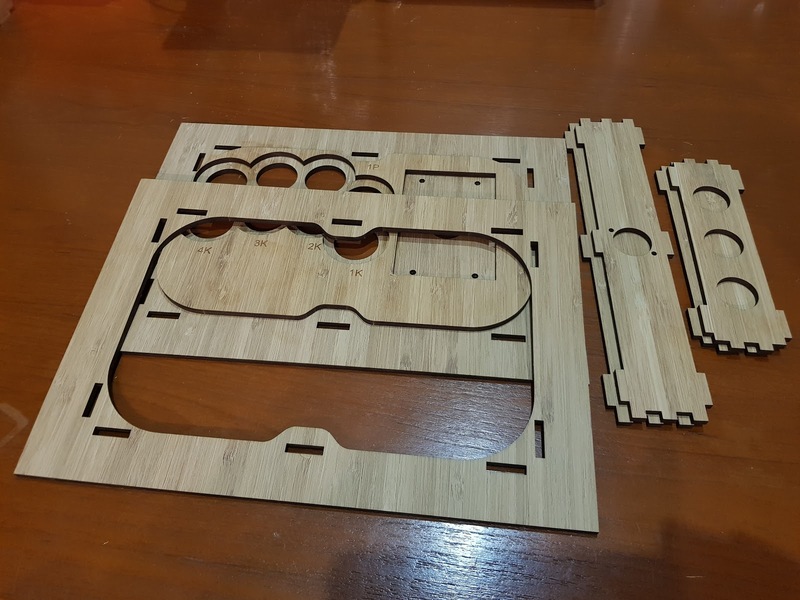 From here you can easily install the joystick with the included M4x10mm countersunk bolts. 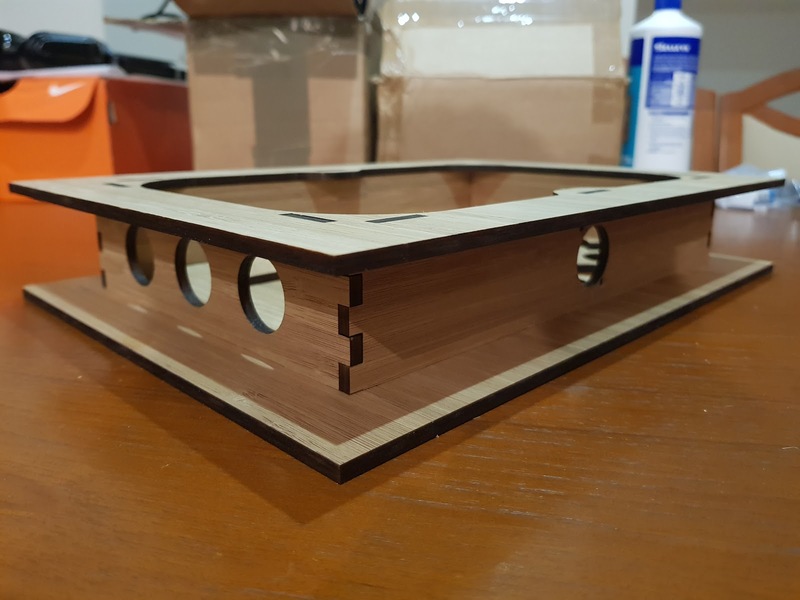 A slightly weaker case can be built which eliminates the visible tabs (the black stripes) for the totally smooth finish typical of my earlier designs. A design or pattern can be etched across the timber, to act as an art layer while preserving the natural timber look. Things like button labels can be baked into the surface. The acrylic simply lays over the top of the timber, with or without an art layer under it. It's also possible to stack up to three layers of acrylic, which allows for 3D effects to the art. I've seen it done a few times and it can look pretty awesome! Then the top is clamped in place with the first Ikea Stromby frame, held down by the supplied spring-steel corner clips. The only work involved is in removing the glass which is bonded to the frame with silicone glue. You can carefully use a solvent to remove the glue, or use gentle pressure (and gloves!) to press the glass out. Or i can do that for you! Then the bottom frame goes on, with an optional art layer under it (double art!). I generally leave the glass in this frame as glass is more abrasion resistant than the acrylic used in the top. Some little silicone feet make it play nice on desks. Some more spring clips hold the bottom on. This makes access to the hardware inside a breeze, with no tools required. The side view of the completed build. These surfaces are the one's i'd typically spray paint. 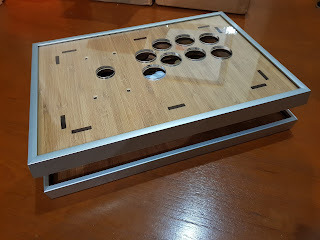 With black frames, using flat black paint makes the timber disappear into a void, which gives the stick a really cool, architectural "floating" look. And the final weight of the little guy comes in at 1.4kg. 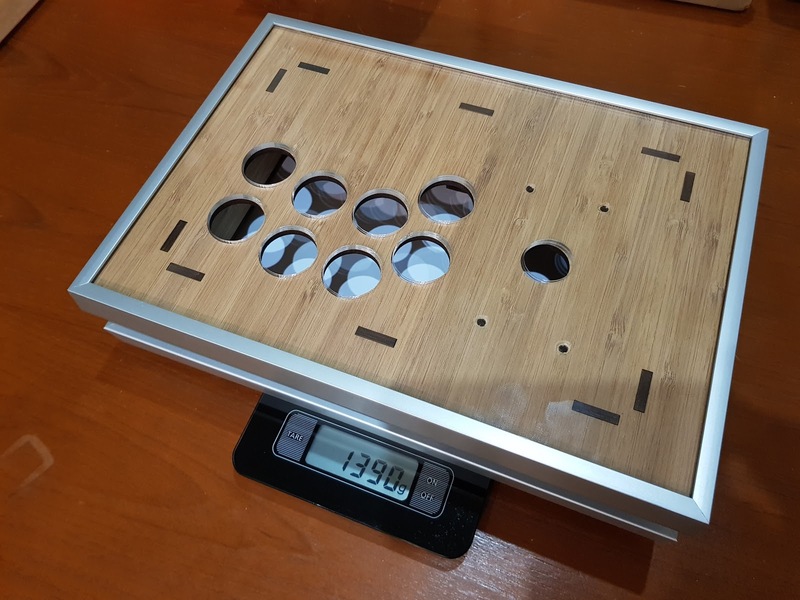 With a stick and buttons it's right around 2kg, which feels comfortably sturdy. The bigger stick comes in at around 2.5kg all up. 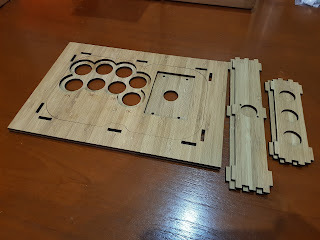 So that's the flat-pack stick! 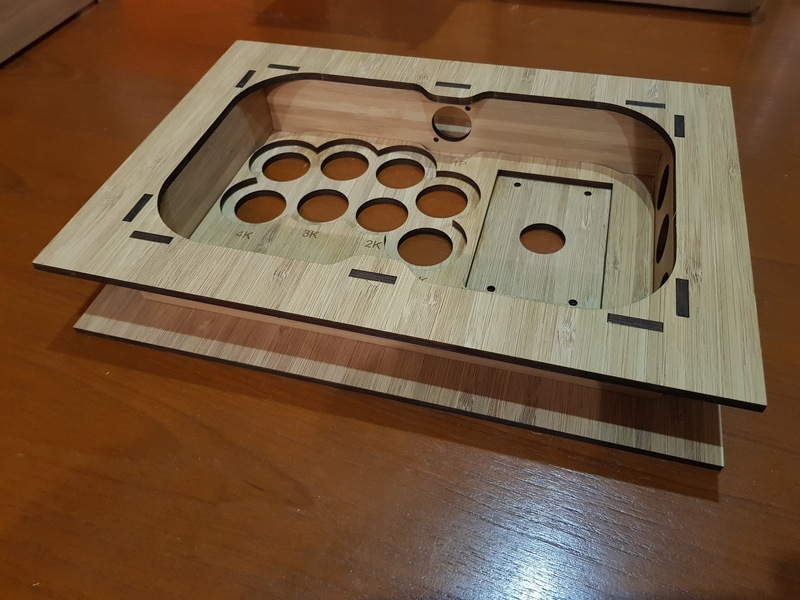 If you're interested in getting your hands on one, the price starts at $100 + shipping, depending on options, which results in a full stick costing less than the Venom!. If you want to check the stick out in person and live in the greater Brisbane area, i'll be bringing a few out to the bigger meets in the region over the new few months (be sure to check out OzHadou!). If you have any DIY or general design questions, hit me up! Would it be possible to add a 4th 24mm button for games that use the "touch pad" button (PS4 PCBs)? 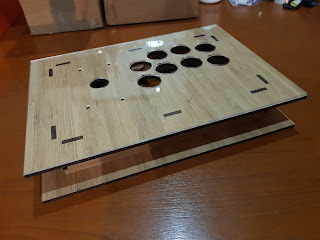 Also, I wonder if there would be some method to make a stick capable of mounting both Fanta and Japanese style sticks. The difference is the mounting hole size, right? Lastly, where do you get your internals? Looking for Sanwa/Seimitsu ones plus PCB and wiring, and FocusAttack/ArcadeShock seem to be pretty expensive after you factor in shipping. The number of buttons is entirely customisable. 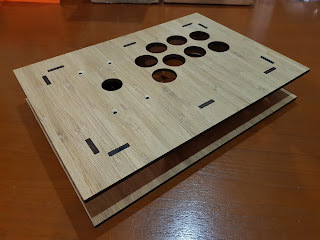 Four will fit down one side of the big stick, to get four on the little stick would mean one or more would have to go on the front or back edge. Which game do you need the touchpad for? 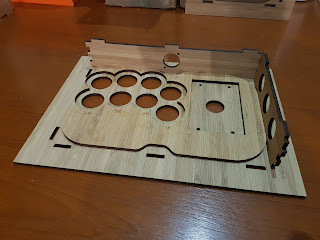 The fanta requires a bigger mounting hole, yeah, and it's big enough to not really work with the washer plates which come with japanese sticks. Maybe it'd work with a custom washer plate. The bolt spacing is also different, but if youre comfortable with two sets of holes it would work. Not that you'd see them under an art layer. I get most of my hardware from arcadeworlduk, the shipping is much less outrageous, and significantly faster. This looks great, much better than those mayflash ones and a very unique look. Do you ship to the US? Not yet, but only because the shipping would completely price it out of consideration. Costs between our countries are pretty nuts, it's why retail sticks cost so much here. Starting next month I'll be shopping around for a US manufacturing partner, which will let me ship locally from within the country, saving significant expense. I just have to go through the process of pricing and quality control. Really digging the stick. It looks so fresh it makes my mouth water.... What would shipping to the Netherlands be? Would love to get my hands on the bigger Stromby version :D.